Those who read this blog regularly know that I don’t create many desserts for Behind the Bites. First of all, I don’t have much experience with the world of sweets and second, I’ll take a bag of beef jerky over a sugary snack ten times out of ten. In other words, I don’t have much of a sweet tooth. Sunday night I made a dinner for a group of friends and I knew that I would need to provide a dessert. I stressed over it more than any of the other dishes. After changing my mind around 30 times about what to make, I decided to go the easiest route possible and make a trifle. The hardest part about it would be choosing the right combination of flavors. I decided to make a strawberry-banana cream treat. 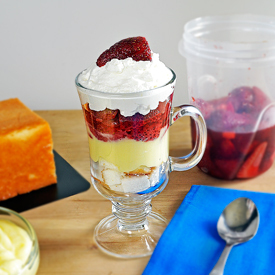 The base of the dessert is cubed angel food cake followed by banana cream pudding, strawberries and whipped cream. The strawberry-banana combination worked really well and I’m pleased to say that this yummy creation lasted only minutes after it was served. I am really proud of how this desert turned out. Like I said in the intro, I’m not that experienced with deserts so I’m a little apprehensive. 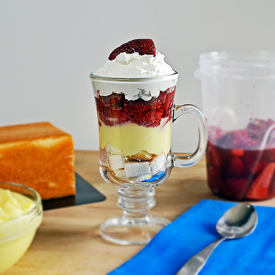 This trifle has opened up a whole new world for me. There are about a million different directions I can take a desert like this, all of the layers can be swapped out for different flavor combinations and textures. 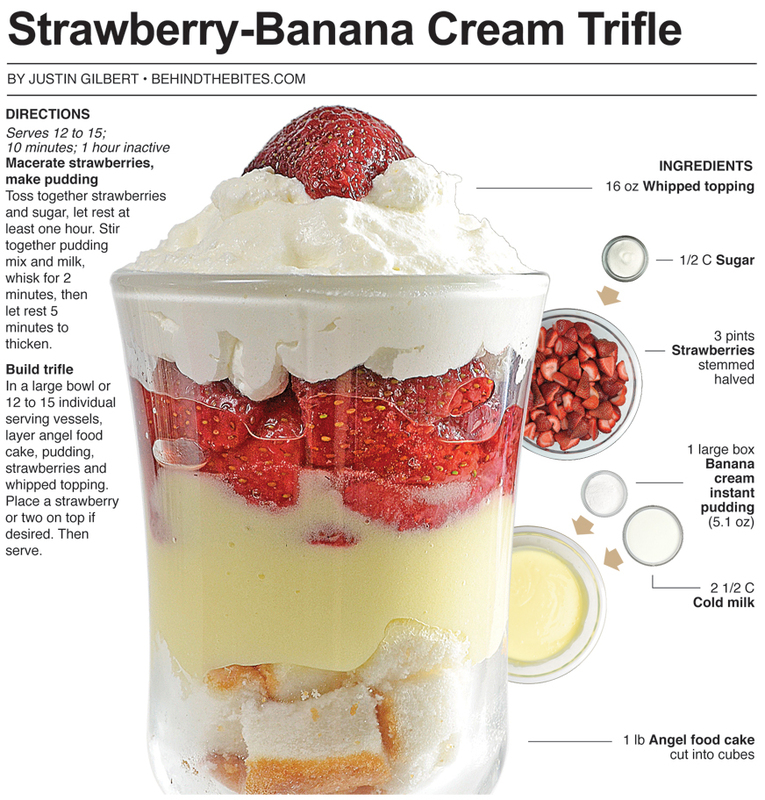 I had no idea instant pudding was so easy. Just add milk to the dry ingredients! Who knew! 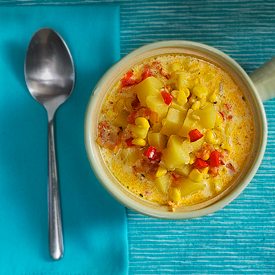 It’s not ideal as far as flavor goes, but when it’s just one element among many instant pudding does the trick and worked just fine here. Chefs and foodies might scoff at the idea but I went with it anyway. I would like to make pudding from scratch for something like this sometime because it would only stand to make it better. 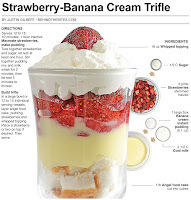 I think I’m going to try another trifle soon, only the next one will feature chocolate and caramel. Toss together strawberries and sugar, let rest at least one hour. Stir together pudding mix and milk, whisk for 2 minutes, then let rest 5 minutes to thicken. 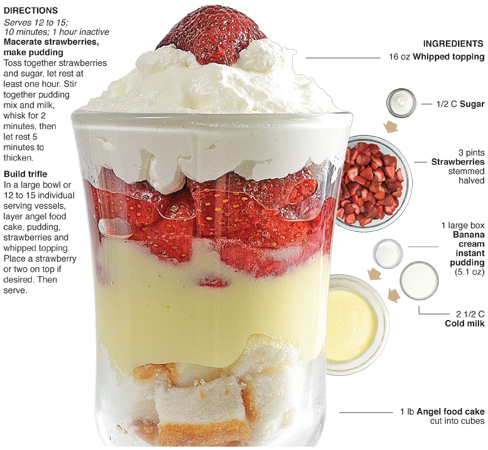 In a large bowl or 12 to 15 individual serving vessels, layer angel food cake, pudding, strawberries and whipped topping. Place a strawberry or two on top if desired. Then serve. 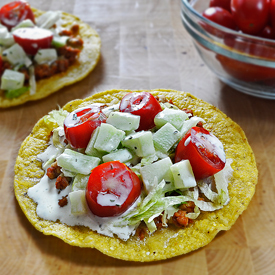 The cucumber salad used to dress this tostada makes it an all star. The salad is absolutely delicious on its own, here it acts as a balance to the spicy chipotle chicken. I used McCormick chipotle chili powder and when compared to their normal chili powder, the chipotle is off the scale as far as heat. I ate a spoonful of the chicken by itself to check the flavor and it literally made me cough – needless to say, the chicken has some kick. That's all neutralized by the cucumber salad though, it compliments the chipotle just perfectly and it allows the flavors to stand out and not be overtaken by the heat. 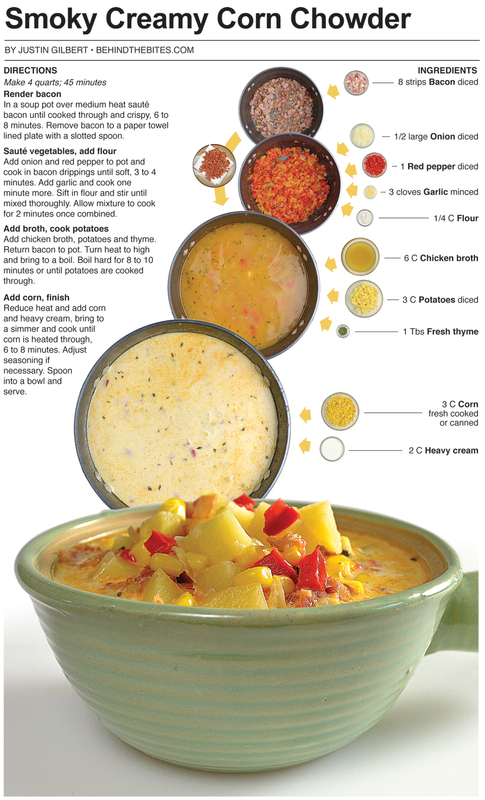 The spice is there but the creamy ranch swoops in to tame the fire before it can set the tongue a blaze. The end result is an absolute show stopper. 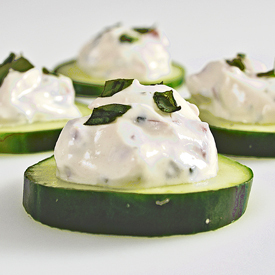 If I owned a restaurant or food truck I would use this cucumber-ranch-chipotle combo in some sort of way on the menu. 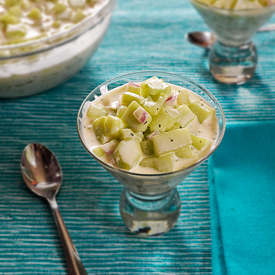 I was so impressed by this cucumber salad that I have made three dishes with it. This dish is made from the leftovers from the first time I made it. The next dish it will appear in features a fresh batch, but that is for another post. I'm really impressed by its flavor and have just went crazy with it. When you have a winner you ride it to the championship! This cucumber salad is the Walter Payton of my kitchen right now. I have found over three years of writing my food column that when you have something that works it’s best to go with it and see where you can take it. Eventually you’ll get tired of it but by building on flavors you can really get creative and make some outstanding stuff that is really original. I wish I could do that with every single thing I make, but for now I’ll pick and choose what I can go crazy on. This happened to be coast effective and plentiful enough to go the extra mile. I wish ribeye were as cheap as cucumbers - that would be an experiment I could never get tired of! In a large bowl, mix together cucumber, onion, ranch seasoning, sour cream, mayo and pickle juice until thoroughly combined. In a sauté pan over medium heat cook chicken in a little olive oil until cooked through, 6 to 8 minutes. Stir and break up chunks while cooking, mix in chipotle, onion and garlic powder half way through. 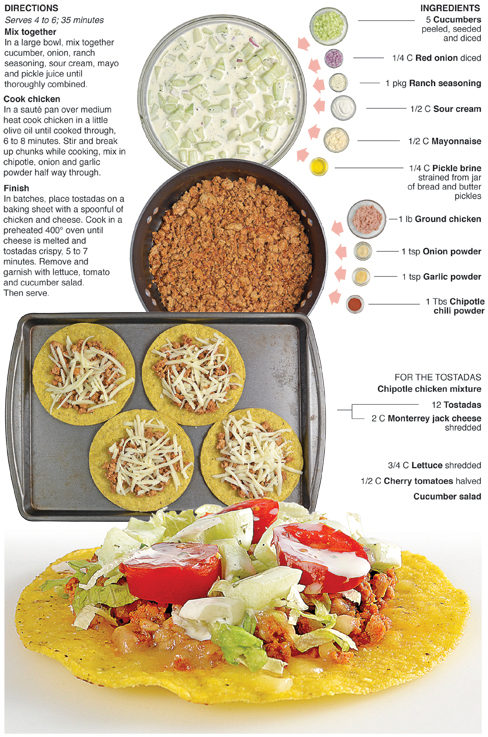 In batches, place tostadas on a baking sheet with a spoonful of chicken and cheese. 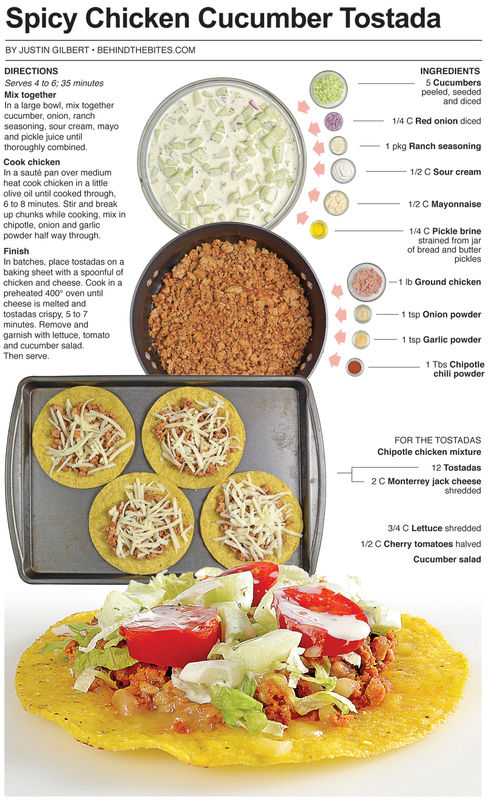 Cook in a preheated 400° oven until cheese is melted and tostadas crispy, 5 to 7 minutes. Remove and garnish with lettuce, tomato and cucumber salad. 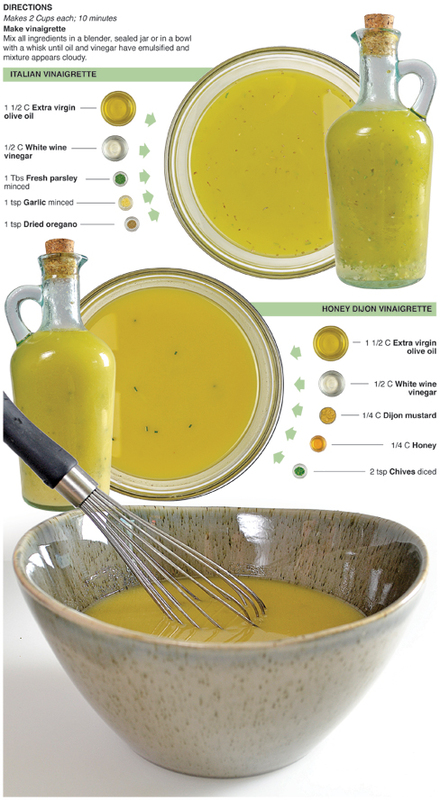 I was surprised by how easy and simple these vinaigrettes were to make. It seems I always have some sort of dressing tucked into the door of the fridge so I don’t think to make it from scratch. I’m glad I did though, both were made from stuff I always have around and were super easy, the only thing I didn’t have in my pantry were the fresh herbs. I loved how light and fresh they tasted on the simple salads I dressed with them. This is just another example of the superiority homemade versus store-bought. Further more, the better the extra virgin olive oil, the better these taste. 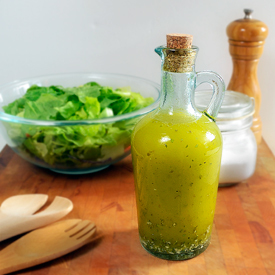 It’s not a bad idea to have some of the good stuff hanging around to make a fresh vinaigrette if impressing guests is the goal or a lighter healthier salad dressing is sought. When I decided I was going to make these I wanted to get a good bottle of extra virgin olive oil, so I went to the store specifically to get some. I settled on a better-quality, higher-priced version than what I usually purchase. I got some other items I needed and proceeded to checkout. The groceries were bagged and I went on my way. I went and watched a ball game with my dad and then settled in at my computer around 11 p.m. I got a message by e-mail from a friend’s mom who said I left a bag at the store. She was behind me in line and saw the checkout girl find the bag that was left behind and told her that she would contact me. Sure enough, the bag I left contained the $14 bottle of EVOO! It was to late to go back that night so I went back first thing in the morning. When I got to the store I checked with customer service. The bottle was never turned in. There is a box for left behind items that the checkout workers put forgotten items and bags in. No such luck for me, I was out $14 and ended up having to purchase another bottle. I would have ordered some really great EVOO from some Italian distributor had I known I would end up throwing down a total of $28! My guess is that the checkout girl did one of three things: Got lazy and left it at the checkout when she was done, put it back on the shelf or returned the item at her station before the end of the shift and kept the money. Either way, I lost on this one. Sometimes that's just the way it is. 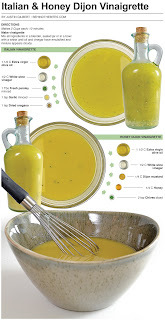 On the bright side, these vinaigrettes were awesome! 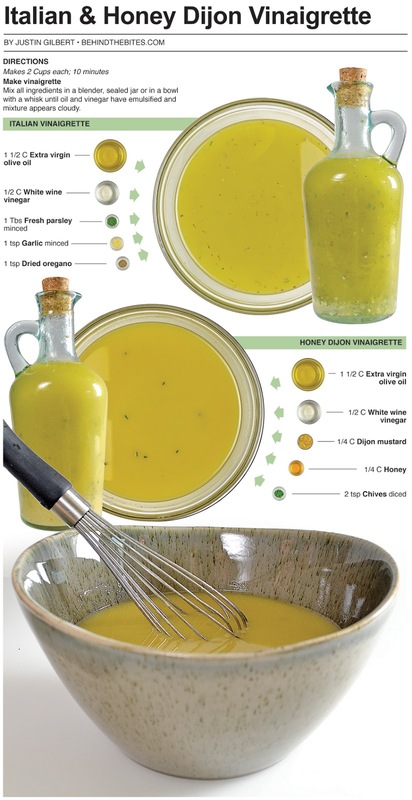 Mix all ingredients in a blender, sealed jar or in a bowl with a whisk until oil and vinegar have emulsified and mixture appears cloudy. Little treats to enjoy while socializing or as a prelude to a feast have been around for centuries, but in the United States the actual word “appetizer” began to appear during the 1860s, most likely as an English alternative to the French word “hors d’oeuvre” for a description of a first course or snack plate. 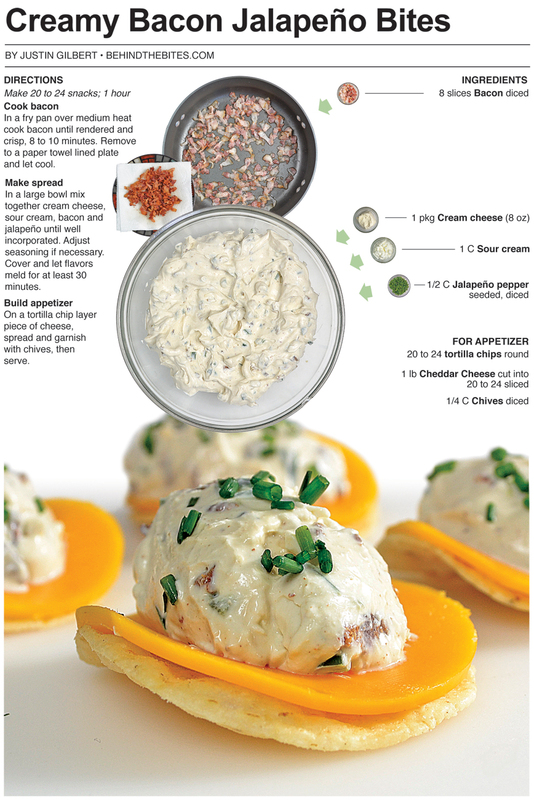 After the repeal of prohibition in 1933 cocktail parties became popular and countless appetizer recipes for snacks to enjoy with drinks began to appear. Around the same time, the modern model for the three course meal of appetizer, main course and desert emerged in restaurants. 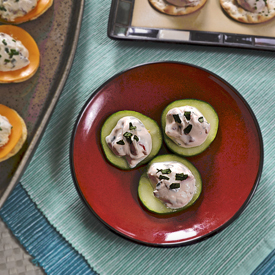 For this recipe, tomato, basil and cucumber star in a garden fresh appetizer. 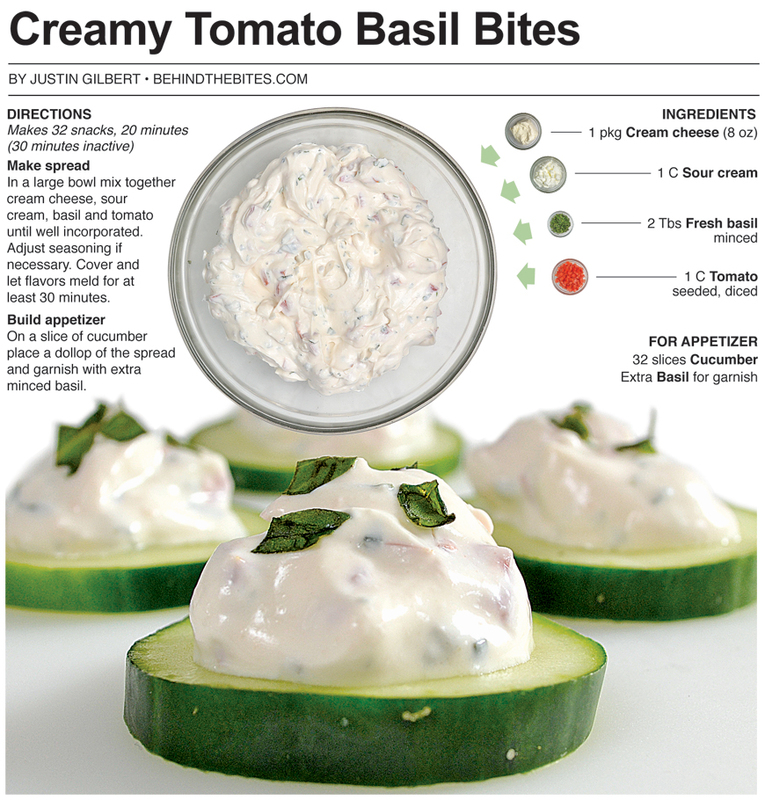 The basil and tomato are the signature flavors and are bound together with cream cheese and sour cream. 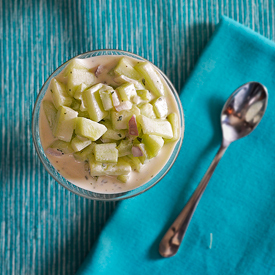 The mixture is placed on a slice of fresh cucumber and can be served before a hardy meal or as part of a slew of snacks to be enjoyed while sipping on cool beverages at gathering with friends and family. 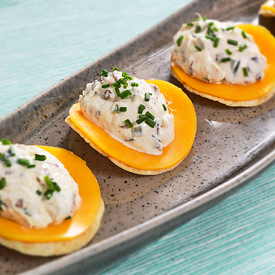 This is the first of several appetizer bites I made recently for a gathering of friends. Here I use a cucumber as the mode of delivery and tomato and basil as the star flavors of this garden-fresh treat. 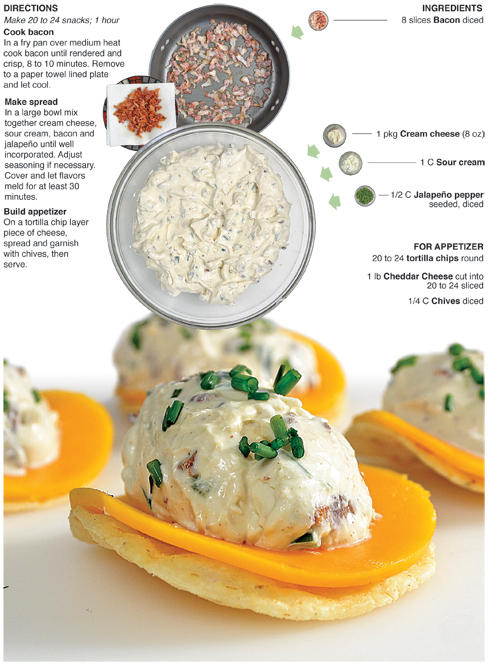 When I decided to make these appetizers this was the first one I thought of. As I was shopping for the ingredients I realized it would be easy to create a number of snacks by swapping out ingredients and changing the delivery method for each bite. 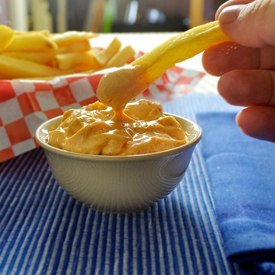 The cream cheese and sour cream are the constants that all the snacks have in common. I was able to provide three different, but similar hor’s douvres in this manor. 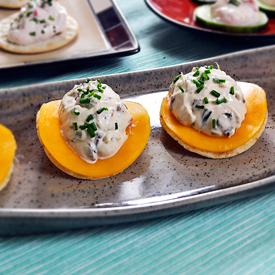 It’s an easy way to create a variety of tasty treats for getting a party started. 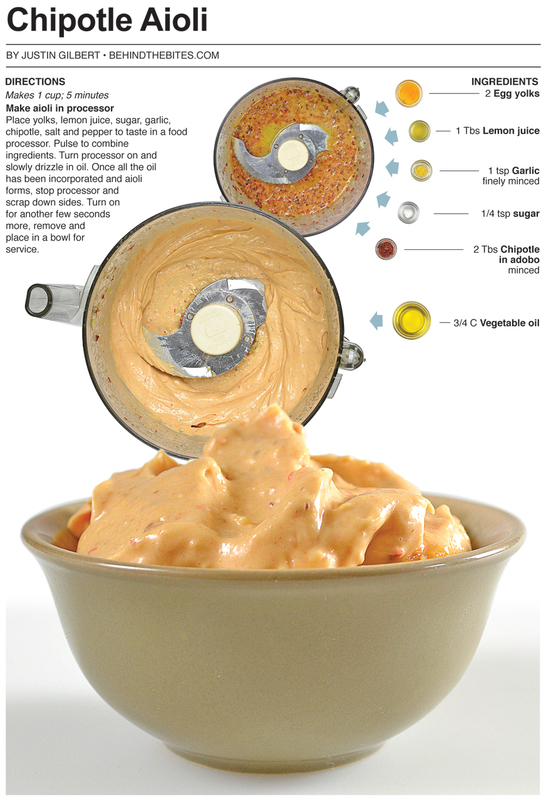 Look for the Jalapeño-bacon version of this for my next post. 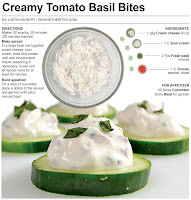 In a large bowl mix together cream cheese, sour cream, basil and tomato until well incorporated. Adjust seasoning if necessary. 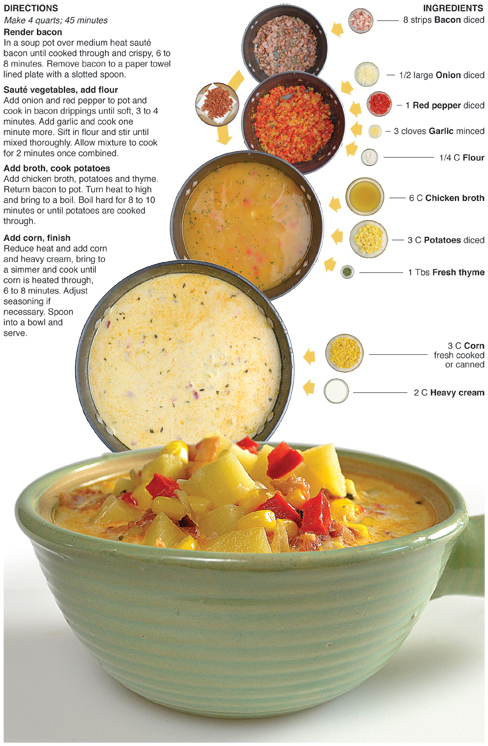 Cover and let flavors meld for at least 30 minutes. 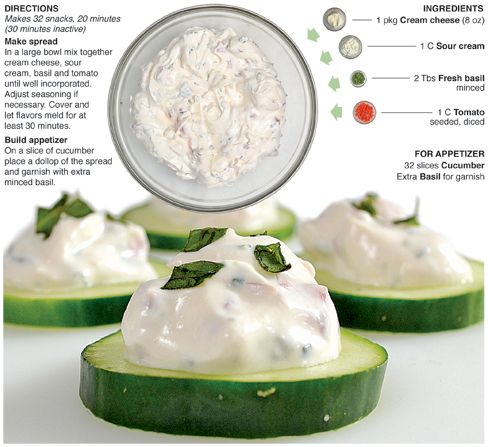 On a slice of cucumber place a dollop of the spread and garnish with extra minced basil. I was shopping recently and came across a spice rack in the produce section. All the spices were sold in small sealed bags rather than bottles. There was a large variety and a few wild cards, one of which really caught my attention: Smoked Cumin. First of all, I love cumin, it’s probably my favorite seasoning beyond salt and pepper. I had never heard of smoked cumin so I had to buy some and try it. From the spice rack in produce I made a b-line to the meat counter. 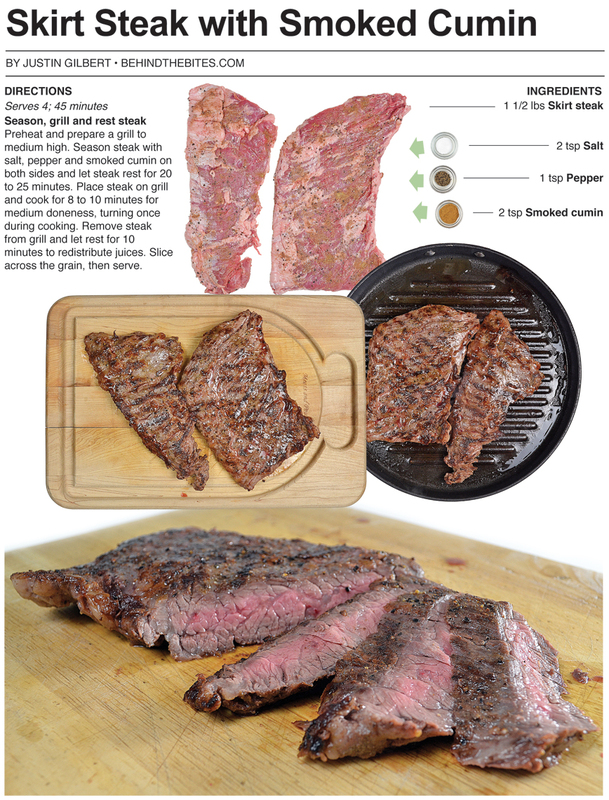 I love to grill steak with salt and pepper and a little cumin. It's very simple, the beef is the star and the cumin is a background note, I picked up a skirt steak and decided this was the canvas to try my new culinary paint. The steak was delicious, which is what I expected, the smoked cumin was good, but the smoked flavor took away from the natural flavor of the cumin, which is kind of smoky anyway. I’ll need to try it again before I eliminate it, but if I had this to do again I would have used regular cumin, it seems to have a much better natural flavor than the smoked version. It was worth the try and I’ll experiment with it again. It won’t be a substitute for cumin in my pantry though. I’ll have to find something new that it works in. This was the steak component of a steak and potato dinner. You can find the potatoes here. I have done it in two posts, because each can stand alone on their own. These recipes are simple, which is how I cook most of the time when I'm not photographing every element for a visual recipe. I always try to add a little more to a dish I’m documenting. It takes time to create these and I feel obligated to go the extra mile most of the time. 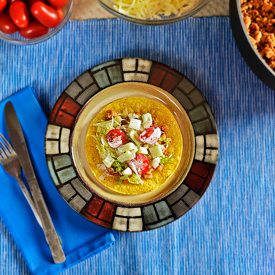 These two recipes are just the basic-I’m hungry-lets eat-kind of meal. I’m glad I documented them. I’m pleased with their look, especially the shot of the final dish that anchors the potato recipe. I should do this a little more. Preheat and prepare a grill to medium high. 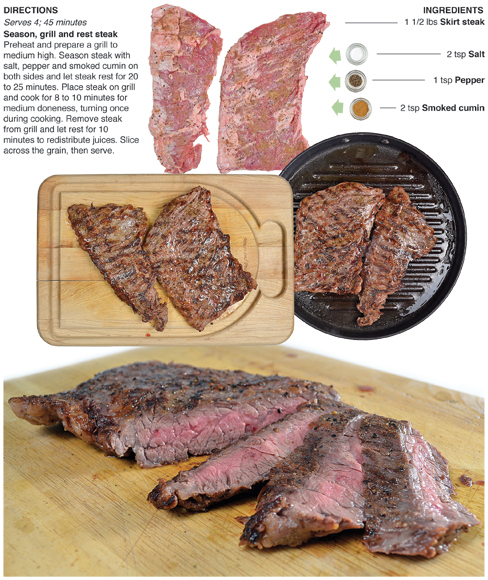 Season steak with salt, pepper and smoked cumin on both sides and let steak rest for 20 to 25 minutes. 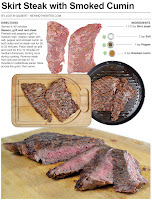 Place steak on grill and cook for 8 to 10 minutes for medium doneness, turning once during cooking. 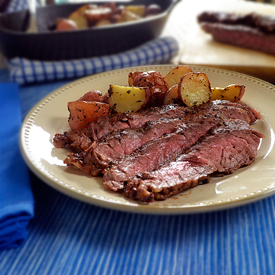 Remove steak from grill and let rest for 10 minutes to redistribute juices. Slice across the grain, then serve. Sometimes simple is just better. A potato is delicious when it is cooked perfectly with salt and pepper. The addition of a fresh herb is an easy way to crank up the flavor. This potato dish is as simple as it gets and it turned out incredibly tasty, the difficult part about it was being patient enough to allow the potatoes to roast until they were fluffy and delicious. 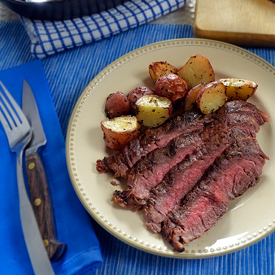 These potatoes were a side dish to a grilled skirt steak, so they didn’t need to be fancy - just cooked right. 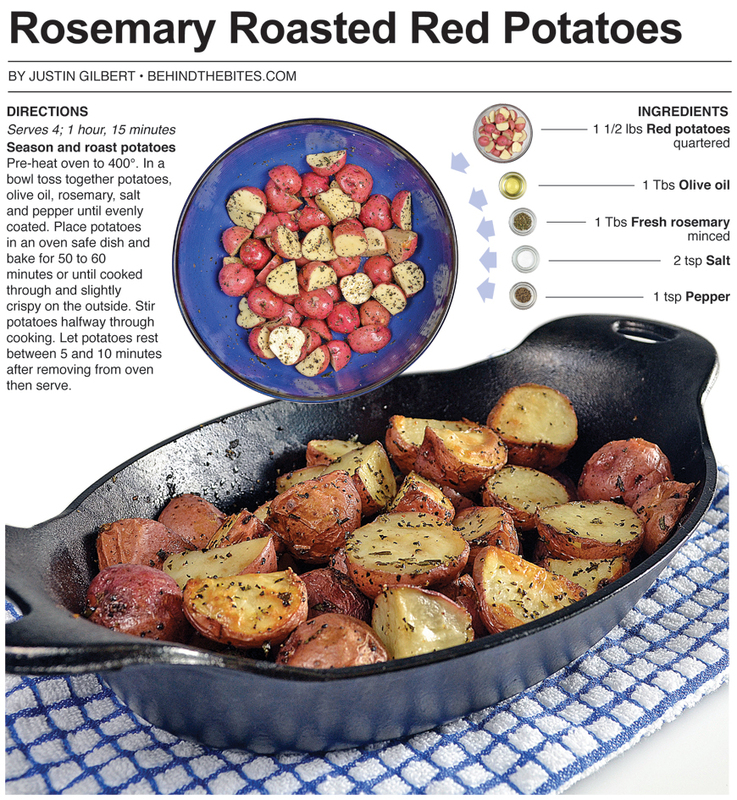 The addition of rosemary elevated the flavor and gave it a nice fragrance which allowed it to stand out on the plate but not over power the star attraction. It is essential to have them seasoned properly and coated with oil, turning or tossing them half way through will help the process also. A perfectly cooked potato is pretty much heaven on a plate. 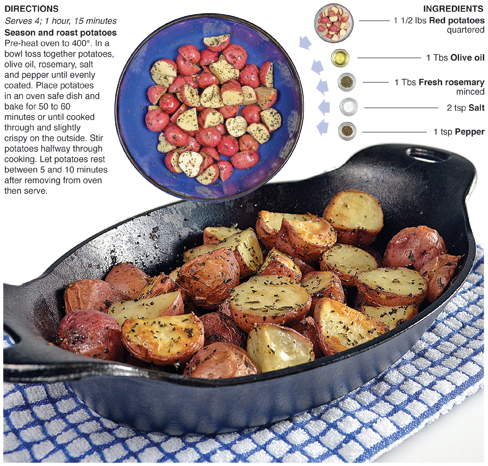 I went out and bought the cast iron dish in the photos specifically for this recipe. I had noticed it at a Kroger store and when I started thinking about roasting potatoes I knew it was the perfect dish to cook AND photograph them in. I’m really pleased with the main art for this recipe, there really isn’t much to the graphic, the dynamic photo really helps make it pop. The towel underneath the cast iron vessel adds to the detail of the shot as well. I’m going to use some of these element in the future, the angle of the dish and towel for extra color work and are things I think I can build on when the dish calls for it. I’m done rambling. 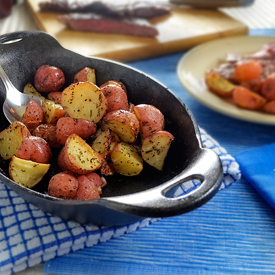 Go make these tasty spuds! Pre-heat oven to 400°. In a bowl toss together potatoes, olive oil, rosemary, salt and pepper until evenly coated. Place potatoes in an oven safe dish and bake for 50 to 60 minutes or until cooked through and slightly crispy on the outside. Stir potatoes halfway through cooking. Let potatoes rest between 5 and 10 minutes after removing from oven then serve. 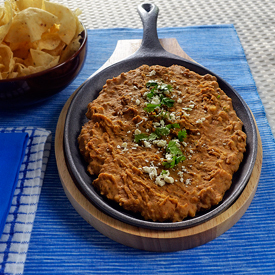 This recipe is an update of a basic refried bean dish I made back in May. This time I added some choice spices and a little cheese to the final product. I also tried to extract some heat and flavor from three habanero peppers while I cooked the beans. 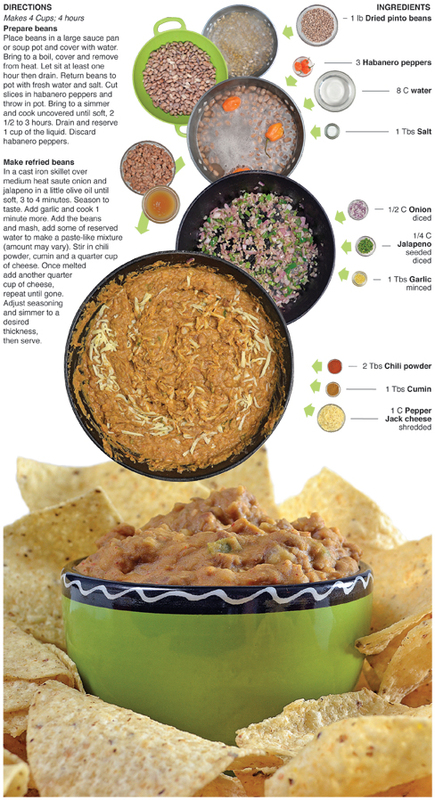 I was going for a much spicier bean dip than what I ended up with. I have used this habanero extraction technique before in barbecue sauce and it worked like a charm, but for some reason it didn’t translate with the beans, I’m not sure but I think the amount of beans to the ratio of liquid might have been what neutralized the heat. It was a little spicy but not habanero spicy. I could have gotten much more kick by skipping the habanero and just adding cayenne pepper in the final stage. The habanero was tame but the jalapeno pepper and the pepper jack cheese were able to bring a little kick of their own to the party. I put together a nacho bar for a church gathering recently and decided it was a good opportunity to improve on my refried bean recipe from a few months back. I have found that nacho, taco or even hot dog bars are some of the best ways to feed a group of people. 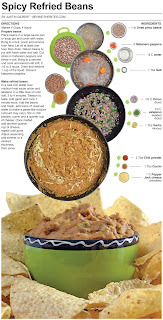 All you need is a variety of toppings to go along with the main proteins. Not everyone at the party is going to put all the items on their hot dog or nachos, they will pick and choose. This can backfire if everyone goes over board, but in general, enough of each topping to cover half to three-quarters of the guests is usually more than enough. If something runs out then people have other options. If your not sure what to take to the next family get together try a couple bags of tortilla chips, canned chili and nacho cheese, throw in some fresh onions and tomato and I’ll bet it’ll be a hit. Place beans in a large sauce pan or soup pot and cover with water. Bring to a boil, cover and remove from heat. Let sit at least one hour then drain. Return beans to pot with fresh water and salt. Cut slices in habanero peppers and throw in pot. Bring to a simmer and cook uncovered until soft, 2 1/2 to 3 hours. Drain and reserve 1 cup of the liquid. Discard habanero peppers. In a cast iron skillet over medium heat saute onion and jalapeno in a little olive oil until soft, 3 to 4 minutes. Season to taste. Add garlic and cook 1 minute more. 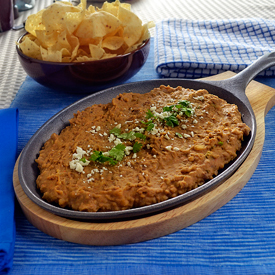 Add the beans and mash, add some of reserved water to make a paste-like mixture (amount may vary). 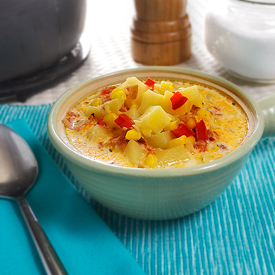 Stir in chili powder, cumin and a quarter cup of cheese. Once melted add another quarter cup of cheese, repeat until gone. Adjust seasoning and simmer to a desired thickness, then serve. It’s official. Ranch seasoning mix is now a “staple” item in my pantry. Normally I don’t like seasoning packets because of the sodium and preservatives that they contain. 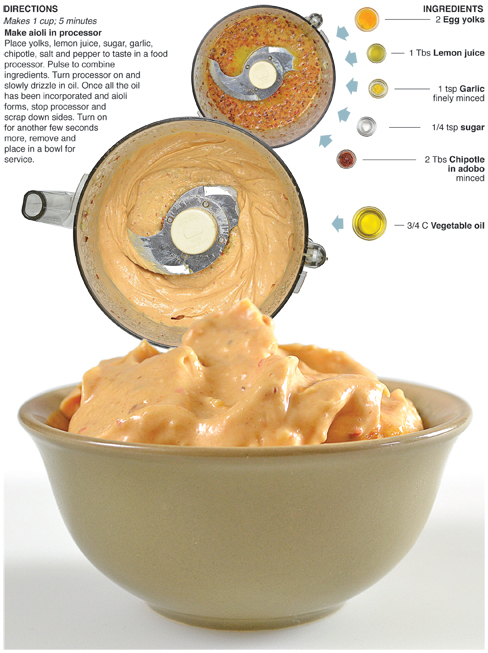 The ranch seasoning has all that stuff but it’s a great way to take recipes to the next level. Over the last couple months, I’ve made ranch coleslaw, 2 different sauces and now this chicken salad that utilizes the seasoning and it really makes the flavor pop! 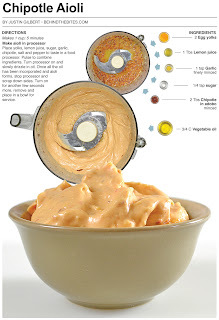 Maybe I should try and make a homemade version because I’m hooked and looking forward to trying it in more dishes. 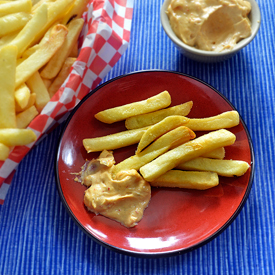 For this recipe, I use the pickle-ranch combo that I used in a delicious sauce a couple weeks ago. 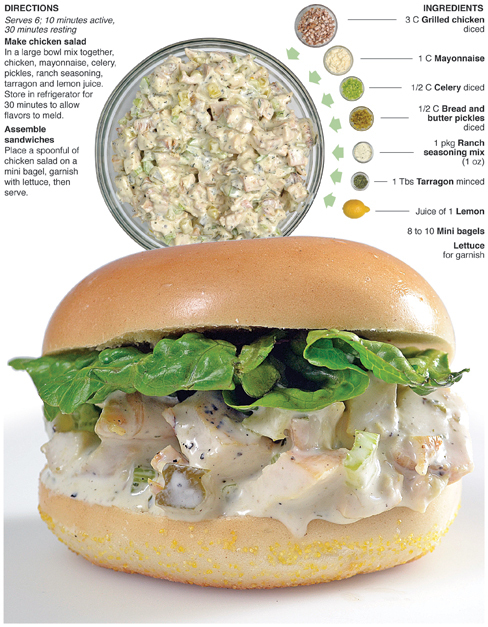 The chicken salad also contains fresh tarragon which adds a hint of liquorice, which reminds me of fennel. 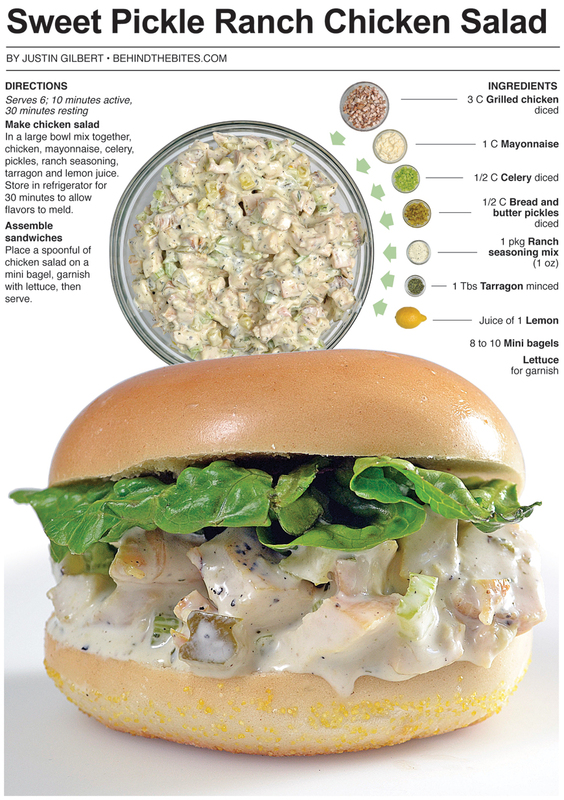 Overall, this chicken salad contained a ton of flavor, led by the zesty ranch and complimented by the sweet but tart pickle flavor. The tarragon comes to play at the end of the bite, but really makes it’s presence know. I think I could have swapped the pickle for bacon and taken this the smoky and salty route which would have been equally unique and delicious, but I think that is for another post. 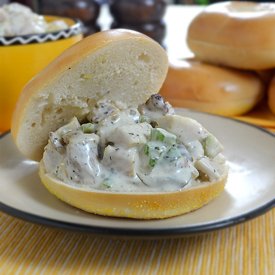 I found mini bagels at Meijer while shopping for the ingredients in the chicken salad recipe and as soon as I saw them I knew I had to use them for the bread. I'm glad I picked them up because the photo seems to jump right out of the graphic. I have worked really hard over the last two years to become a better food photographer and sandwiches and tacos are my favorite things to style and shoot. They stand alone on a white background really well – actually I like food that can be eaten by hand, that way there is no plate in the picture, it’s just what is going to be eaten. In the end, I love shooting all types of food, it just seems that the sandwiches and tacos are my favorite photographs to take. Ironically, they're also my favorite foods to eat! 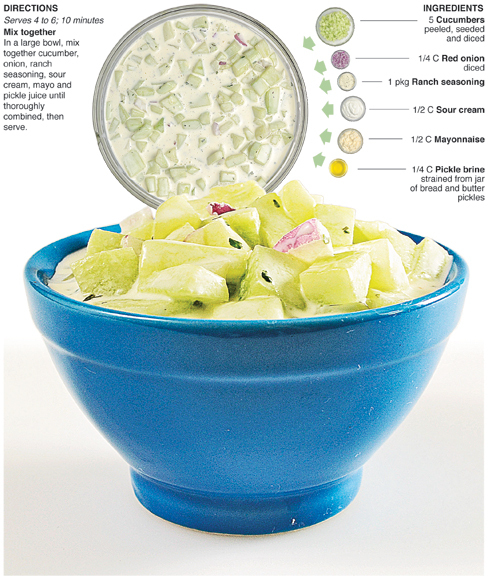 In a large bowl mix together, chicken, mayonnaise, celery, pickles, ranch seasoning, tarragon and lemon juice. 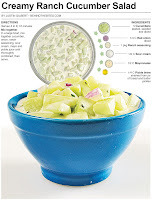 Store in refrigerator for 30 minutes to allow flavors to meld. 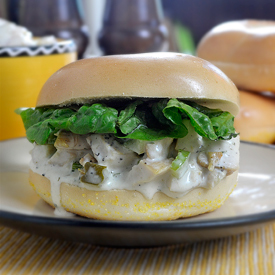 Place a spoonful of chicken salad on a mini bagel, garnish with lettuce, then serve.